Suresh did his best to tie it properly. At least it didn’t fall off for the next couple of hours 😉 . After about 10 kms, the fuel meter decided to go crazy and showed petrol level as very low. A short distance later, I found a petrol bunk. I was happy, but I was low on cash as the ATM was not working. The guy at the bunk didn’t know English. Immediately, the cog wheels in my brain started spinning to generate a translation for “Do you accept credit card?” He didn’t understand my “hindi” 😉 … I showed my credit card and made signs. He shook his head that “seemed” like “yes.” I tanked up and gave him my card. He immediately replied saying that they don’t accept cards. I became furious. I just had Rs. 173.50/- including all change & like hell he’d accept that ! I parked my bike at the bunk and hired a cab to the town. Another 500 bucks. 10 kms on the hills is a pretty long distance. The cab dude took about 30 sweet minutes, an hour fighting with the ATM and at the bank proving my identity etc. Precious time was running out. 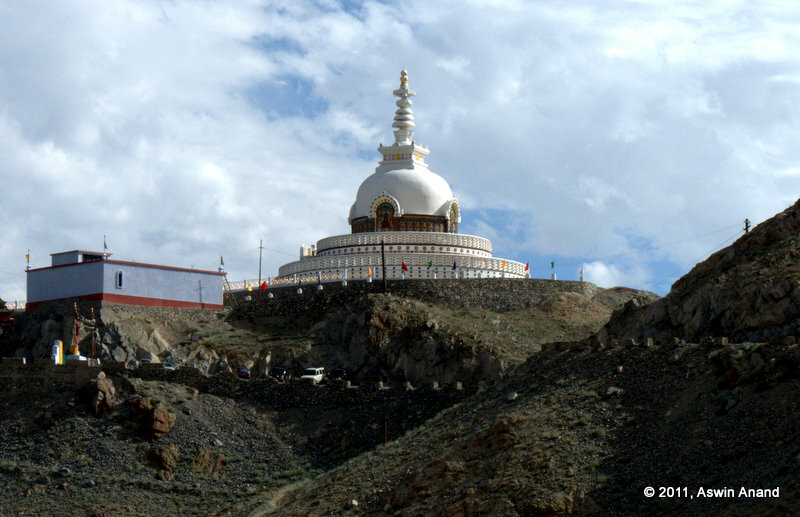 We were supposed to reach Leh the same evening and it was still 220 kms away. Finally I got the needed cash and it was already 12 PM. Everyone were ahead of me. 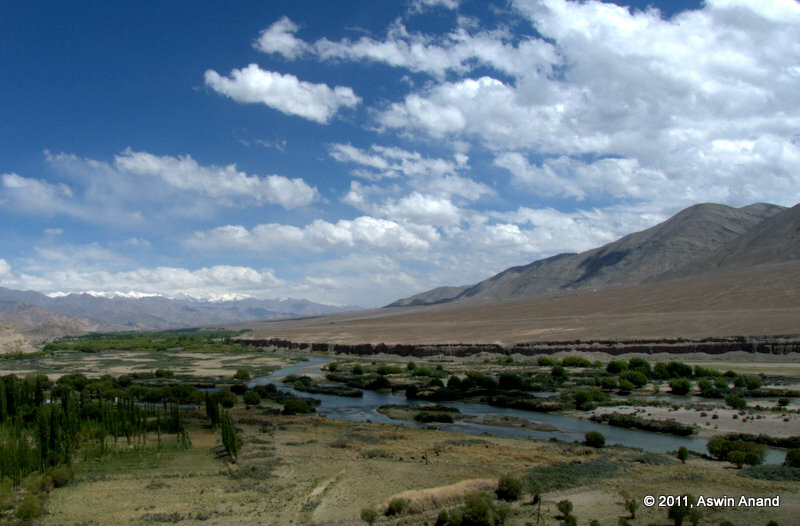 With jittery knees and sliding luggage, I started driving towards Mulbekh that was 40 kms away. 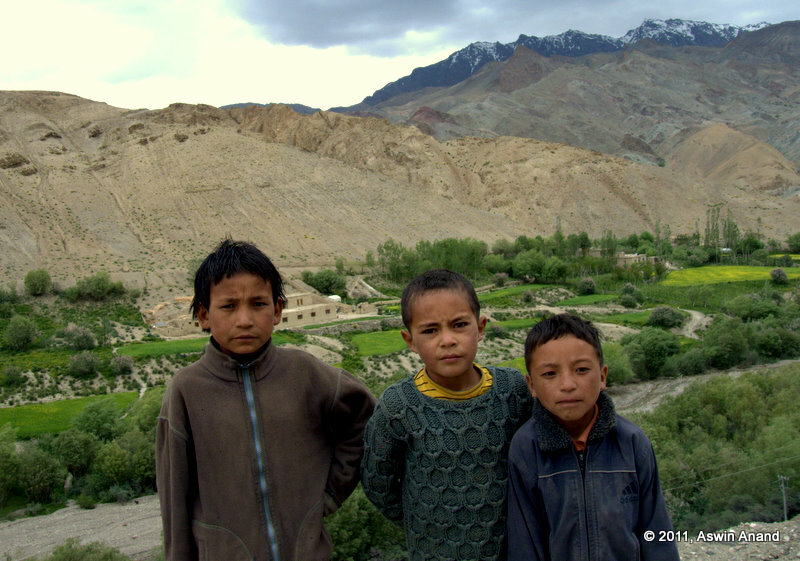 With no stops, I reached Mulbekh to find Ram, Rock and Suresh waiting there. As we were eating, Balu came in. They had gone on a totally different route and caught up pretty fast. After lunch, we started driving towards Fotu La. For about an hour after starting from Mulbekh, I was driving alone. Balu was yet to pass me. I was passing through breathtaking landscapes left, right and center. Suddenly the bike was swaying to one side. There wasn’t any wind too. The luggage had come off again. I stopped my bike and tied it again. Five minutes later, it came off again. After such a game for another 30 minutes, the luggage fell off completely even before I could stop the bike. Three huge backpacks! I was looking for some help in tying the luggage again; when an Indian Oil tanker lorry passed me. I waved at him and he stopped immediately. He was a big and burly Sardar with a beaming smile. He asked, “kya hua? (what happened)” to which I replied, “luggage gir gaya (luggage fell off).” He helped me tie it. I thanked him and overtook his lorry. As soon as I completed the overtake, the luggage fell off again 🙂 . He jammed on the brakes and the lorry stopped just at stone throwaway’s distance from the backpacks. He beamed again & we tried our hand at it again. The road was dusty and we were covered in red dust as another lorry passed us. After trying in vain for 10 minutes, we gave up. Balu was yet to pass me. The driver’s name was Gurcharan Singh. He offered to carry our backpacks in his lorry until a place called Buddhagarpu & I immediately agreed. Thinking about it now, I still don’t know how I believed a complete stranger with my luggage. With no luggage, my bike was as light as a feather. I was able to stop at my will and wish. I was totally free. Every few kilometers, I would stop and check if the lorry was coming. He would wave at me from inside and I used to proceed. At some point, Balu passed me and stopped. He asked about the luggage. When I explained the story so far, Balu & Ajay laughed like anything and went ahead. Super cute kids with ladoo cheeks were playing cricket on the road and when I passed, they extended their hands for a clap. At one point I was far ahead of the lorry. While waiting, I even played cricket with them 😀 … It was super fun I tell you. You just have to be there to experience it. Fresh mountain breeze with a few clouds above, the sun not too harsh and smiling, snow capped mountains in the distance … OMG ! … the view was amazing with every passing minute. 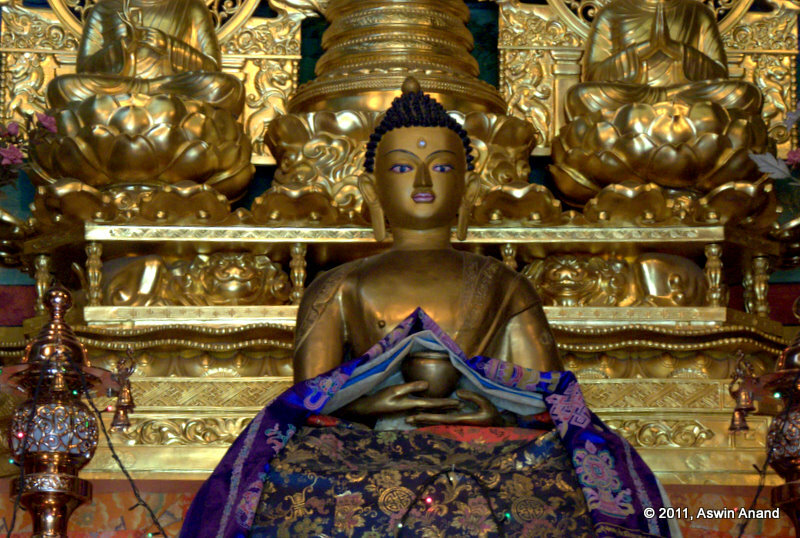 Finally, we arrived at Buddhagarpu. He didn’t get a nice place to park his lorry & the place which he got was a slope. So, I assisted him in keeping a huge rock for the lorry’s rear wheels as he was standing on the brakes to stop the lorry from moving. After a hearty tea and listening to his stories of his Ladakh travel, it was time to go. It was past 5 PM then and it would become dark in about 2 hours. 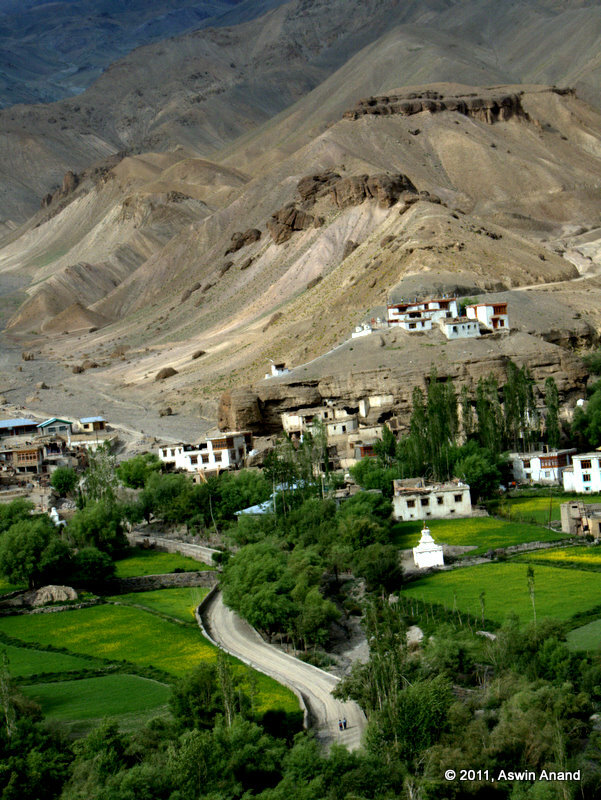 I wouldn’t be able to drive until Leh for sure. I was not even able to contact my friends to tell my whereabouts as none of the mobiles were reachable. Singh-ji said I should try and stay for the night at Khaltse because driving in dark was dangerous. 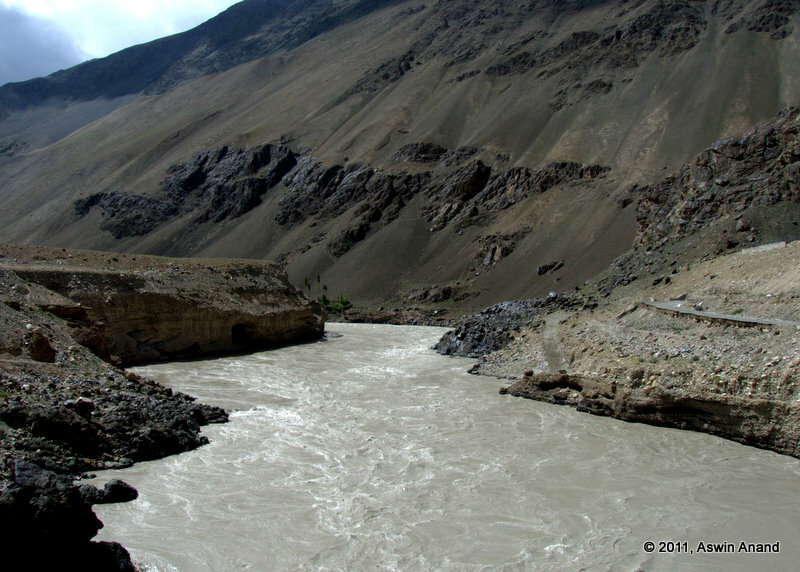 Moreover, the journey in itself is the destination at Ladakh. We would be missing many things if we were driving in dark. We tied my luggage again with the help of a shopkeeper. I took my bike for a test drive and it all seemed fine 🙂 and then … you guessed it ! I started on the highway and crossed a bridge after Buddhagarpu. The road climbed a bit steep and Murphy played again. Luggage came off. My backpack was almost grazing the tarmac. I swore heavily and waited at the road for some help. Thankfully, a worker from BRO (Border Roads Organization) passed by. I stopped him & as I held the backpacks in place, he tied the luggage again. It looked strong. The minute I started driving, it slid a bit but then, it didn’t slide further. 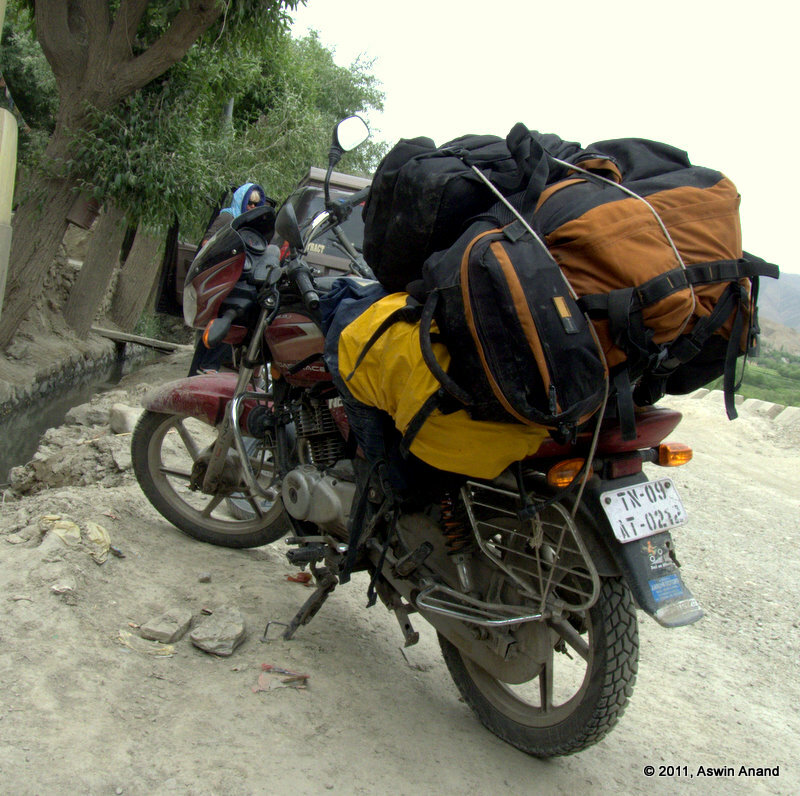 With some confidence, I shook the bike really hard & the luggage stayed in place. Very skeptical, I tried another test round with random curves thrown in. The luggage was still in its place. Yay! But it was tilted to one side. The side effect was that, if I let my handlebar a bit loose, the bike would move as it wished. As long as the luggage didn’t fall off, it was okay. After Buddhagarpu and the luggage drama, I was driving at a consistent speed. Within about 20 kms of driving, I came to Fotu La. 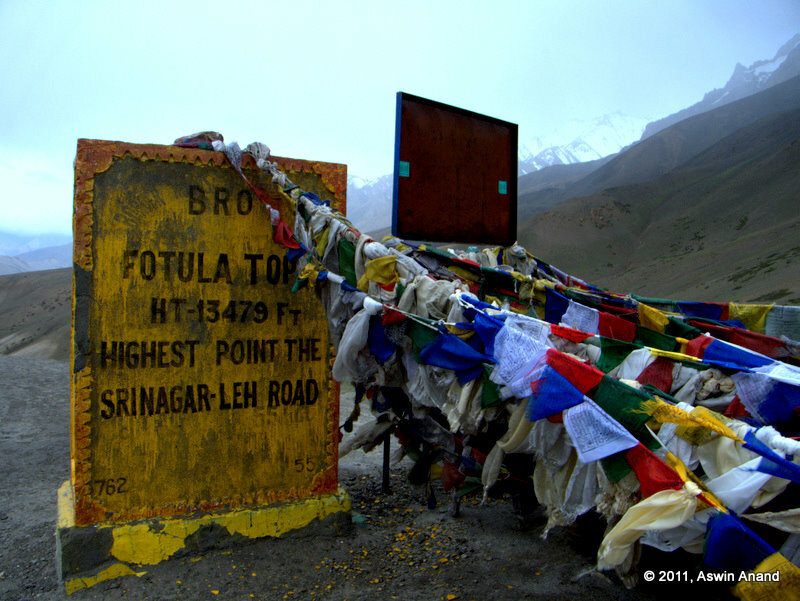 Fotu La was the highest point on the Srinagar-Leh highway. Prayer flags were tied at the place and I was the only one there. Clouds were passing through and the sky became dark. It rained a little and I started prancing in the middle of the road. With no one to see my dancing nonsense, my joy knew no bounds. I heard the familiar sound of a lorry engine from behind. Gurcharan Singh caught up with me at Fotu La & waved at me. I was very happy on seeing him & suddenly realized I spent more than 45 minutes at Fotu La. Precious distance could have been covered in that time. He stopped the lorry and told me to start immediately. He also warned that it would get dark and cold. He started his lorry again ONLY after I started from the place. For a short distance, we were driving in parallel to each other, waving at each other in sign language etc. Then I started going a little faster. Before long, Gurcharan Singh was way behind. 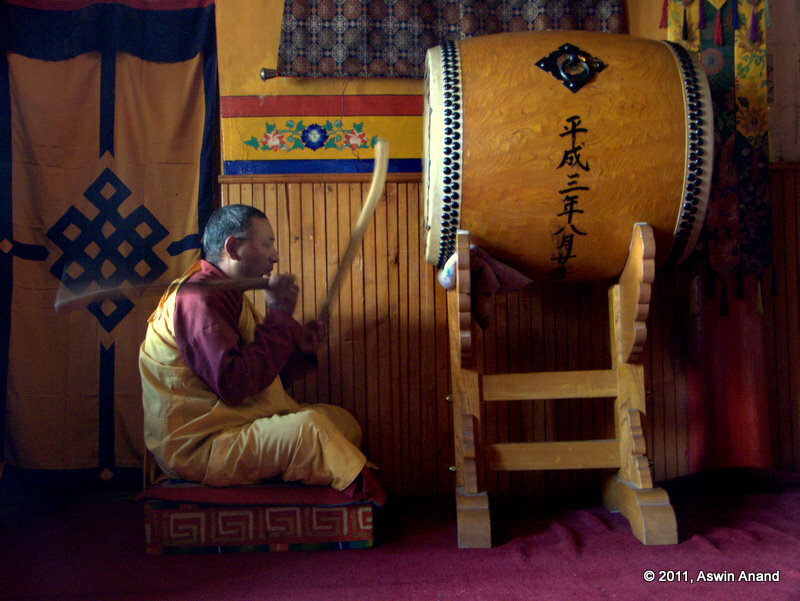 I bid him farewell and was on my to Khaltse. NH 1D goes through Lamayuru where you can witness moonscapes. However, due to some road repair work, they closed the road near Lamayuru. There was a diversion to go to Khaltse and I took that diversion. Unlike the NH (National Highway), this road was small and steep with lots of hairpin bends. Rain was falling slowly and my hands and feet were wet. I had been driving for close to 2 hours at a mind-numbing 30 kmph and the chill started to get to me. I was the only one on the diversion. I sung at the top of my lungs and it all echoed from the bottomless bottom. Picture this – A tiny bike and an even tinier human on a massive landscape, negotiating hairpins on steep roads with a heart that knew only joy at that instant! About one hour in to the diversion, I noticed two trucks coming in the opposite direction. I could easily see them from the top. Eventually, I would be required to pass them. The problem? When the truck was on the road, nothing else could pass on the sides. It covered the road fully in all glory & my leaning tower of luggage became a concern now. I stretched my legs a little bit and it sent a tiny shock down my hips, considering how cold they were. Pretty soon, I took a hairpin bend and was on the same stretch as the lorry. I was going downhill. The lorries were climbing at about 5 kmph. He flashed his headlight telling me to stop. But considering that I was cold and had heavy leaning luggage, I didn’t stop at all. He didn’t stop too. We both were going at each other. The right side of the road had huge rocks. There was no place to move aside. The left side was very deep. Taking a gamble, I flashed my headlight, honked continuously and kept moving ahead. As the distance between us shortened, he jammed on his brakes. I could hear the sound of the heavy air brakes & he switched off the lorry. Another lorry was right behind it. He stopped too. The driver of the first lorry was waiting for me, leaning outside the window. I didn’t want to face him at all. I reduced my speed from 25 kmph to 2 kmph 😉 and very slowly moved to the left side of the road, right next to the first lorry. He was saying something in Hindi, which kind of meant, “Hey saala, if I tap you ever so slightly, you will tumble all the way to the river below.” My eyes and brain were intent on the road. My luggage was brushing both the lorries as we were passing through. My left leg was hanging in air, outside the road, facing the void below. It was the hardest 5 minutes of the trip. Soon, I passed both the lorries. I stopped my bike and heaved a huge sigh of relief. I got down from my bike and signalled thumbs up to the lorry drivers. He would never understand how much his act of stopping the lorry to allow me to pass aroused my spirits. Soon, the detour ended. I was back on NH. It became completely dark. The roads were awesome. I zoomed & soon reached Khaltse around 9 PM. With my worst ever Hindi possible, I managed to negotiate a room for 350 bucks for the night, untied my luggage and started to call my friends who were ahead of me. I was guessing that they would be reaching Leh around 10.30 PM. After a long trial of more than 30 minutes, someone’s phone started ringing but he didn’t pick up. Driving probably. I was tired from the day’s ordeal & wanted to eat and sleep. Immediately, I remembered one of my college friends in Chennai. I called him, explained the situation and told him to call my friends after 11 PM to inform them that I was safe and that I was staying at Khaltse. Meanwhile, they had reached Leh & Paari and Rock shed a tear, not knowing my whereabouts and wondering whether I was safe 🙂 … I didn’t have any words to say when I heard that they had actually shed a tear. I kind of choked. 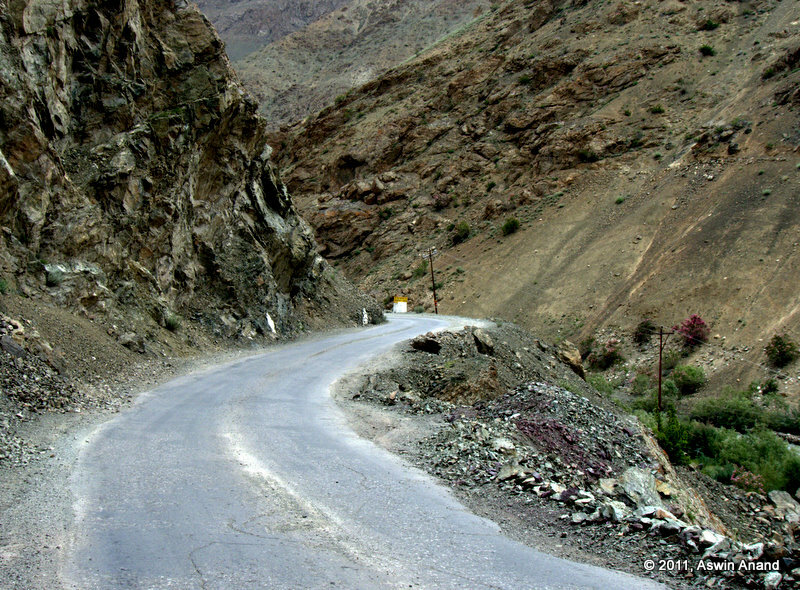 I still had about 90 kms to get to Leh. The next day, I woke up fresh and well rested. I realized that during the last 5 kms of the previous day’s ride, it had become dark and I couldn’t enjoy the landscapes. So, I got ready quickly and went back an additional 10 kms to check out the diversion and landscapes ahead. A puffed up gushing river was flowing under a bridge and a rough wind was blowing across. On the way to the bridge, an auto jumped right in the middle of the road out of nowhere. Shocked out of my wits, I jumped on my brakes. Wheels got locked and my bike was skidding. I managed to stop my bike just inches in front of the auto. My heart was pounding. I came out of it and then headed to the bridge for a moment of peace. Soon, all of it was forgotten and I was clicking pictures to my heart’s content. On the way back to the hotel, I was very careful and watchful of unruly autos. But I didn’t expect what was about to happen. A mom and a kid were sitting at a shop. Suddenly, the kid jumped out of her hands and ran in to the road. I swerved my bike to avoid the kid and braked hard again. I missed the kid by a hair’s width. He picked up something from the road. His mom thrashed him and he started crying. My heart started pounding. Two close encounters in two hours was as bad as it could get! The helper boy at the hotel, named Munna, was indeed very helpful. Using his expert tying skills, he tied my luggage in no time & shook the bike so hard that I thought it would break in to pieces. The luggage hadn’t moved one bit. 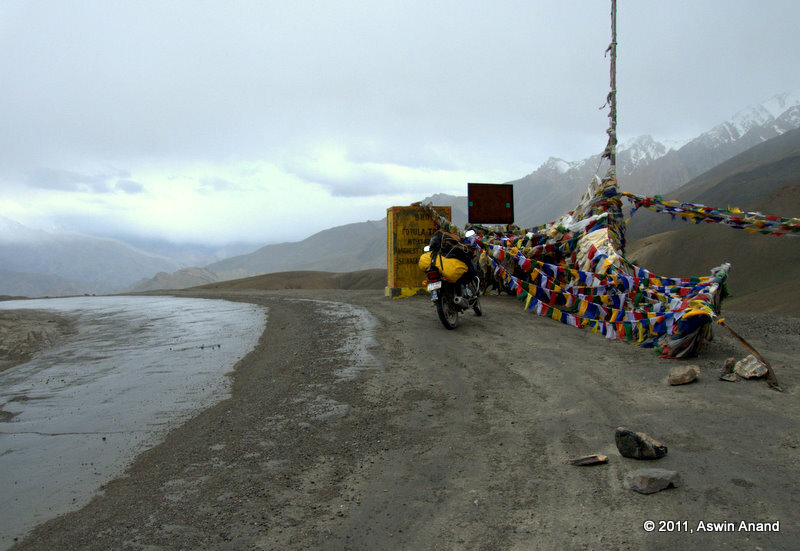 I was thrilled 😀 … I was confident that such a tight roll of the luggage would easily take the hairpins and the bad roads that Ladakh had in plenty. The next stop was at Saspol, 30 kms away. Clapping kids’ hands on the way, I crossed two hairpins. The third hairpin curved steeply upwards & then disappeared in to another curve. A speeding car emerged out of nowhere and threatened to knock me out of the mountains. I was half way on the hairpins. I jammed my brakes. He jammed his too. His car didn’t move. But my bike started sliding downwards even after applying the brakes. Such was the steepness of the curve. The bag on petrol tank went below the handlebar. So, the bike refused to turn in the other direction. Through all this, the car driver was smiling happily as I was struggling to stop my bike from going downwards. Soon, the bike stopped. I set the bag properly and started again. After the 2nd curve, the road straightened. It was an absolute straight stretch for about 3 kms, with shiny new tarmac. A river was flowing parallel to the road. It was awesome. My bike picked up speed and my spirits were up again. After a chai break at Saspol, I was on my way again. There were two more graceful straight stretches where I touched max speed on my 125cc bike. Before long, I reached the outskirts of Leh and came to a view point with beautiful views of the valley below with the Indus flowing through it. I met Ram and Suresh on the outskirts somewhere, clicking some pictures. I got the address of the place where they were put up and made it there. I treated myself to a sumptuous lunch, some sleep and then visited Shanthi Stupa. Shopped a little at the Leh market and then crashed at the room. I had never ever slept like that. The next day, we were supposed to conquer Khardung La and Nubra Valley, followed by a ride to Pangong Tso on an unmapped road through Agham and Durbuk. More posts coming soon … Stay tuned! Well… for some parts of it, I couldn’t help it (like the petrol bunk not accepting card etc.). If I hadn’t lost those 2 hours there, I could have easily made it with you guys. The hotel guy at Khaltse said you guys left just 30-45 minutes ago. I could have easily caught up. 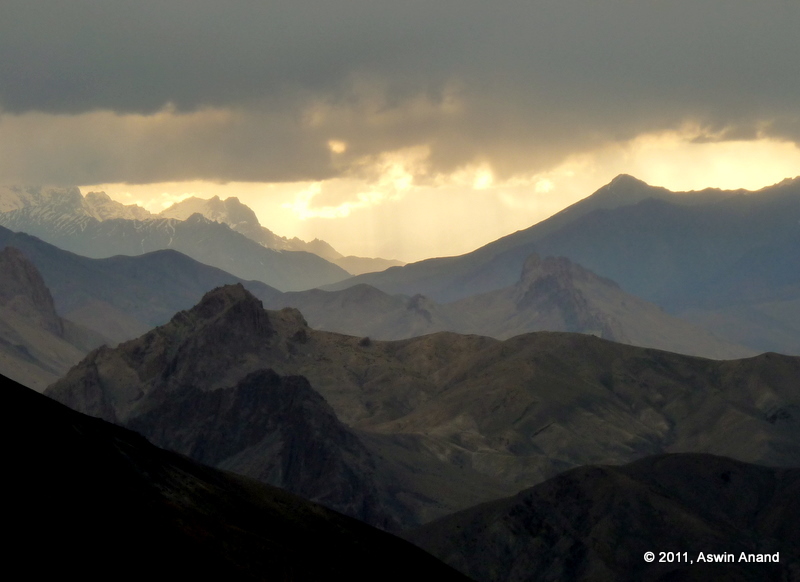 But the main reason I stayed behind at Khaltse was to enjoy the landscape in day time. 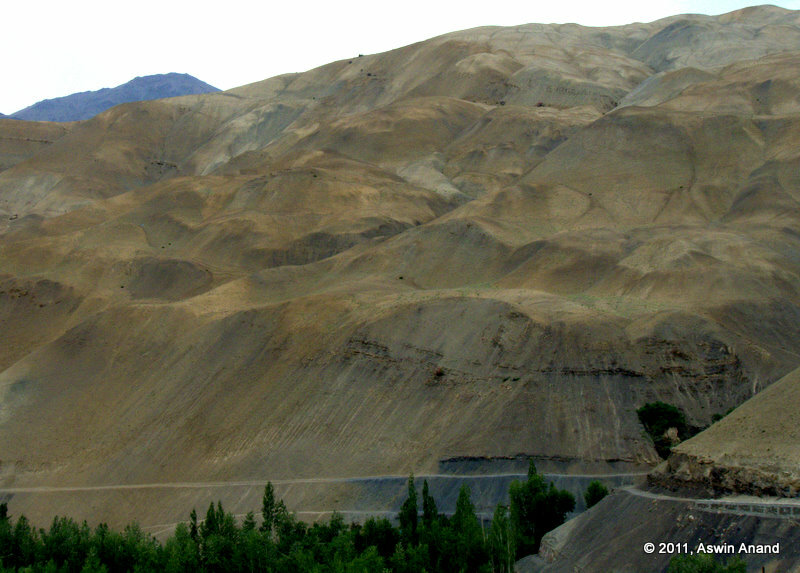 Much of Ladakh is about landscapes and there’s no use driving in dark. U r still thinking Paari cried for u? “A tiny bike and an even tinier human on a massive landscape, negotiating hairpins on steep roads with a heart that knew only joy at that instant!” — NAAIICE! Better post some snaps of urs in Kargil…. Kep goinga nd keep posting..